The continuing lack of security and instability in the country impact negatively on the ability of human rights defenders (HRDs) to carry out their work. They are subjected to threats, intimidation, harassment, surveillance, arbitrary detention, forced disappearances and extrajudicial killings. Perpetrators include both state and non-state actors, including warlords, members of the Taliban, government agents, and conservative social groups. HRDs working in the area of women's rights and transitional justice as well as independent journalists face particular risks. International aid workers have also faced threats and attacks. 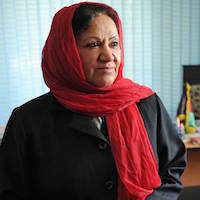 The work of Afghanistan's Independent Human Rights Commission (AIHRC) has been severely affected by lack of adequate resources, made more severe with the drawing down of international forces and aid from the country in late 2014. At the same time, the government has attempted to strengthen control over the media, and dozens of cases of harassment, threats and physical attacks against journalists are recorded each year.